Just in time for an emergency Mother's Day or Graduation Gift! 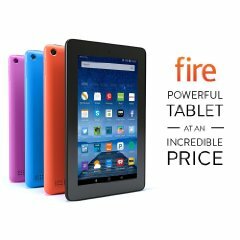 Get $10 off the entry level Kindle Fire 7", which now comes in three bright colors as well as basic black. This usually retails at just under 450 bucks, so this is a pretty good deal. Amazon also has a Mother's day gift page for more ideas. And check out Amazon's Summer Toy List.